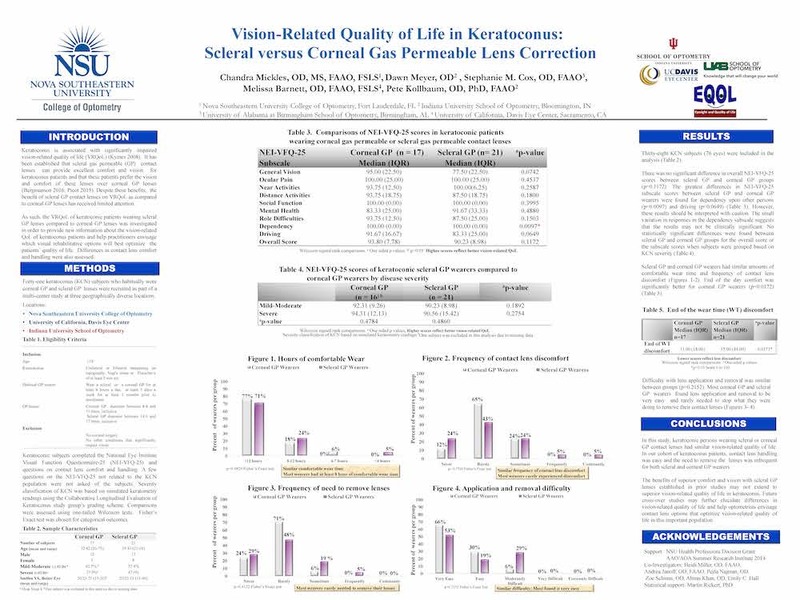 Identify differences in vision-related quality of life (VRQoL) for keratoconic (KCN) persons with scleral gas permeable (SGP) correction as compared to corneal gas permeable (CGP) correction. Contact lens comfort and handling were also assessed. Purpose: Identify differences in vision-related quality of life (VRQoL) for keratoconic (KCN) persons with scleral gas permeable (SGP) correction as compared to corneal gas permeable (CGP) correction. Contact lens comfort and handling were also assessed. Methods: Three geographically diverse locations administered surveys to KCN subjects who habitually wore SGP or CGP lenses in the absence of corneal surgery, other conditions impacting vision, or piggyback lens systems. Severity classification of KCN was based on simulated keratometry using the Collaborative Longitudinal Evaluation of Keratoconus study group’s grading scheme. Outcome measures included the National Eye Institute Visual Function Questionnaire-25 (NEI-VFQ-25) and questions on lens comfort and handling. Comparisons were assessed using one-tailed Wilcoxon tests. Results: Thirty-five KCN subjects were included in the analysis. There was no significant difference in overall NEI-VFQ-25 scores between SGP and CGP groups (p=0.18). The greatest differences in NEI-VFQ-25 subscale scores between SGP and CGP wearers were found for the dependency upon other persons (p=0.01), general vision (p=0.07) and driving (p=0.07) subscales, with SGP scoring better in all three subscales. No statistically significant differences were found between SGP and CGP for the overall score or the subscale scores when subjects were grouped based on KCN severity (all p > 0.05). End of the day comfort was significantly better for SGP wearers (p=0.009). Difficulty with lens application and removal was similar between groups (p=0.30). Conclusion(s): KCN persons wearing SGP and CGP have similar VRQoL. The benefits of superior comfort and vision with SGP lenses may not extend to superior VRQoL in keratoconus. Future cross-over studies may further elucidate differences in VRQoL and help optometrists envisage contact lens options that optimize VRQoL in this important population. Dr. Mickles is an Associate Professor at Nova Southeastern University College of Optometry. class. Her Master of Science in Vision Science and residency training in Cornea and Contact Lenses were completed at the University of Alabama at Birmingham School of Optometry. Additionally, Dr. Mickles completed a two year Veterans Affairs Optometric Research Fellowship at the Birmingham VA Medical Center. Dr. Mickles has lectured and published in the areas of contact lenses and ocular surface disease. Understanding myopia control in the context of public health is important because of the recent rapid rise in the prevalence of myopia globally and the future projections of myopia reveal that there will be 4.5 billion myopic in 2050. The risks to vision impairment and blindness through myopic macular degeneration and ocular diseases are emerging as a frequent cause of blindness in China and Japan and will likely be the case elsewhere with the growing prevalence of myopia and high myopia. The translation of animal experiments and clinical research examining optical, therapeutic and behavioral strategies to control myopia will be discussed so that the eye care practitioner will have a set of clinical guidelines that will help guide them in making evidence-based decisions in managing their patient. Five of the seven white paper reports, exploring key topics of myopia to provide guidance and recommendations emanating from an evidence-based review and analysis of the literature by committees of experts tasked in their specialty areas. The five reports covering the key areas in myopia: 1. Definitions and classifications, 2. Interventions, 3. Experimental models, 4. Clinical trial guidelines and instrumentation to assess myopic changes, 5. Clinical guidelines for clinical practice and national health. These white-papers will form the guidelines from which clinicians, researchers, industry and policy-makers can refer to for their decision making in clinical practice, conducting clinical trials, education and advocacy at the public health, patient and policy level. The details of the key findings will be presented and discussed in an open forum where audience members can participate and contribute. The white papers will eventually be published in an IOVS special issue in late 2018. Professor Smith received his OD (1972) and PhD (1978) from the University of Houston and subsequently joined the faculty of the UH College of Optometry. During his tenure in the College of Optometry, he has served as the Chair of the Basic Sciences Department and as the Associate Dean for Graduate Studies and Research. Professor Smith currently holds the Greeman-Petty Professorship in Vision Development and is serving as the Dean of the College of Optometry. Professor Smith’s research interests are focused on the optics of the eye. He received the Glenn Fry Award (1996) and the Prentice Medal (2010) from the American Academy of Optometry for his research on the role of vision in regulating refractive development and eye growth. Professor Smith has published over 150 referenced papers and received 29 years of research funding from the National Institute of Health's (NIH) National Eye Institute (NEI). He is also an accomplished lecturer, having received teaching awards at the department, college and university level and in 2003 was selected by the Texas Optometric Association as its Educator of the Year. Professor Smith is an active member of the vision science community. He is a Fellow of the American Academy of Optometry, an ARVO Fellow (inaugural class), a past President of the American Optometric Foundation (2002), a past Member and Chair of NIH NEI's Central Visual Processing Study Section (1998-2003) and a past member of NIH's National Advisory Eye Council (2005-2008). Professor Smith currently serves on the Board of Directors of Prevent Blindness Texas, as the Secretary of the Partnership Foundation for Optometric Education, and as the Past-President of the Association of Schools and Colleges of Optometry. Following a 1st class Optometry degree from Manchester, a pre-registration year at Moorfield’s Eye Hospital, London, a PhD at Cardiff University and a clinical/research fellowship at the University of Melbourne, Australia, Professor Wolffsohn was appointed by Aston University in 2000, where he was Head of Optometry 2004-9 and Deputy Executive Dean for Life and Health Sciences 2009-16, being awarded a personal Chair in 2007. He is now associate Pro-Vice Chancellor. James has published over 200 peer reviewed academic papers and given numerous international presentations. His main research areas are the development and evaluation of ophthalmic instrumentation, contact lenses, intraocular lenses and the tear film. He is the academic Chair of the British Contact Lens Association, having been a past president, was a harmoniser and sub-committee chair for TFOS DEWS II and joint-Chair of the International Myopia Institute reports. Kate Gifford (formerly Johnson) operates an independent practice in Brisbane, Australia, with specialty interests in contact lenses, binocular vision and myopia control. Graduating from Queensland University of Technology (QUT) in 2003 with First Class Honours and a University Medal, Kate is now undertaking a part-time PhD by clinical research. She is a fellow of the BCLA, IACLE, CCLSA (Australia) and AAO and is the current National President of Optometry Australia. Kate is an award-winning clinical supervisor and visiting lecturer at QUT, holds 21 peer reviewed and professional publications, and has presented over 50 lectures at conferences in Australia and internationally. To evaluate whether bilateral lateral rectus recession (BLRc) or unilateral recess-resect (R/R) surgery results in better outcomes for intermittent exotropia (IXT) in children. Purpose: To evaluate whether bilateral lateral rectus recession (BLRc) or unilateral recess-resect (R/R) surgery results in better outcomes for intermittent exotropia (IXT) in children. Methods:197 children age 3- < 11 years with basic-type IXT and near stereoacuity of 400 arc-seconds or better, were randomized to BLRc or R/R. The primary outcome measure was the cumulative probability of "suboptimal surgical outcome," defined as exotropia ≥ 10Δ or constant esotropia ≥ 6Δ at distance or near by simultaneous prism & cover test, or decreased stereoacuity of ≥2 octaves from baseline, at ANY 6-month masked examination from 6 months to 3 years after surgery. Reoperation was allowed by protocol only after meeting suboptimal outcome criteria; however, when reoperation was performed without meeting criteria, it was considered a suboptimal surgical outcome for analysis. 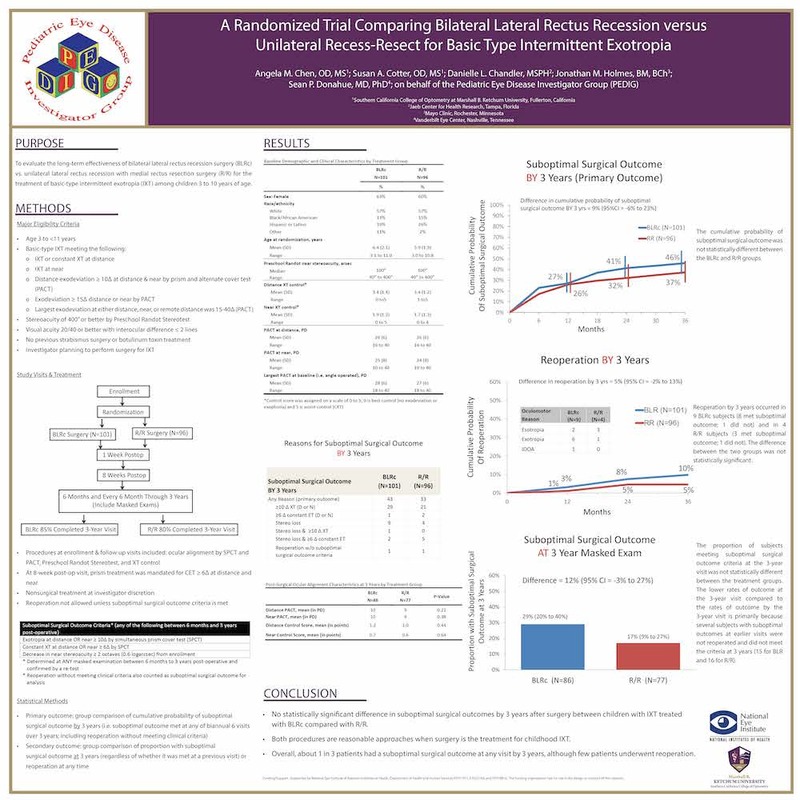 Results: The cumulative probability of suboptimal surgical outcome was 45.9% (43 of 101) and 37.3% (33 of 96) in the BLRc and R/R groups, respectively (difference = 8.6%; 95% CI, -5.8% to 23.0%). Reoperation by 3 years occurred in 9 (9.8%) BLRc subjects (8 met suboptimal outcome; 1 did not) and in 4 (4.6%) R/R subjects (3 met suboptimal outcome; 1 did not) (difference = 5.2%; 95% CI, -2.3% to 12.7%). Among those with a full 3 years of follow up, 29.1% (25 of 86) and 16.9% (13 of 77) in the BLRc and R/R groups, respectively, met suboptimal surgical outcome criteria at the 3-year visit (difference = 12.8%; 95% CI, -2.8% to 28.0%); this lower rate is primarily because several subjects with suboptimal outcomes at earlier visits did not meet the criteria at 3 years. Conclusion(s): There was no statistically significant difference in suboptimal outcomes by 3 years after surgery between children with IXT treated with BLRc compared with R/R. Both procedures are reasonable approaches when surgery is the treatment for childhood IXT. Dr. Angela Chen is currently an assistant professor at the Southern California College of Optometry at Marshall B. Ketchum University. She does didactic and clinical teaching in the Pediatric Vision and Vision Therapy department. Dr. Chen is a fellow of the American Academy of Optometry and a diplomate in the Binocular Vision, Perception & Pediatric Optometry Section. Her research interests include strabismus, amblyopia, and non-strabismic binocular vision disorders. She serves as a clinical investigator in several NEI supported studies for the Pediatric Eye Disease Investigator Group (PEDIG) and the Convergence Insufficiency Treatment Trial-Attention and Reading Trial (CITT-ART). Due to the constant increase of life expectancy, seniors driving is becoming a public health problem. 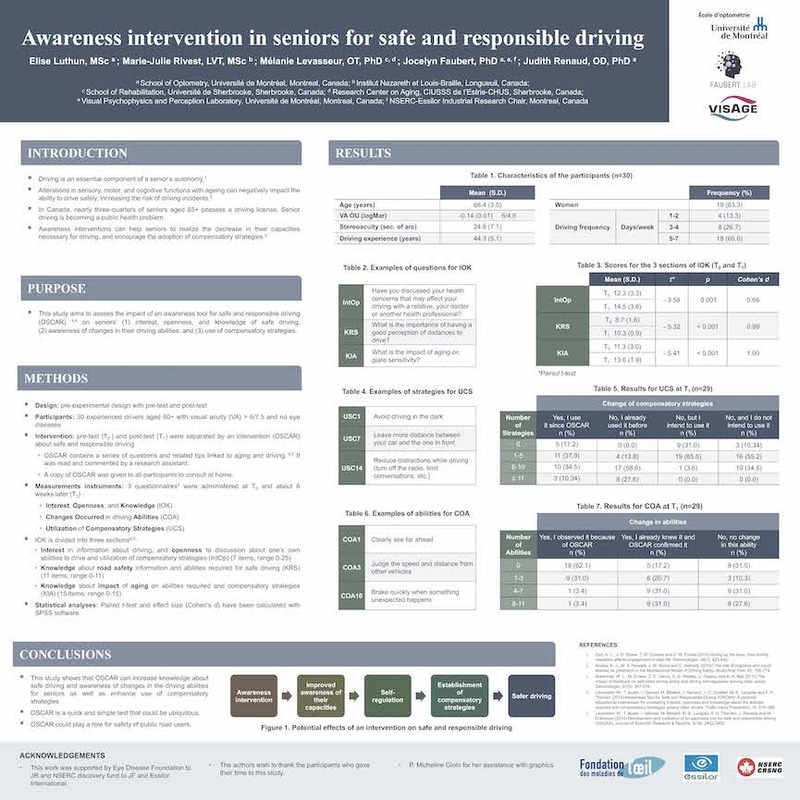 This study aims to assess the impact of an awareness tool for safe and responsible driving (OSCAR) on seniors’ (1) interest, openness and knowledge of safe driving; (2) awareness of changes in their driving abilities; and (3) use of compensatory strategies. Purpose: Due to the constant increase of life expectancy, seniors driving is becoming a public health problem. This study aims to assess the impact of an awareness tool for safe and responsible driving (OSCAR) on seniors’ (1) interest, openness and knowledge of safe driving; (2) awareness of changes in their driving abilities; and (3) use of compensatory strategies. Methods: A preexperimental design, with pretest (T0) and posttest (T1), was used with 30 experimented drivers, aged 60 to 77 years and presenting good visual acuities with their habitual corrections. At T0, participants were asked to answer three questionnaires: 1) Interest, Openness and Knowledge (IOK), 2) Changes Occurred in driving Abilities (COA) and 3) Utilization of Compensatory Strategies (UCS). Afterwards, the participants received an intervention about safe and responsible driving; OSCAR was read and commented by a research assistant. A copy of OSCAR was given to all participants for them to consult at home. Eight weeks after the intervention (T1), the participants responded again to the same questionnaires (IOK, COA and UCS). The scores before (T0) and after (T1) the intervention were compared with paired t tests and the effect sizes were calculated. Results: Overall, the results show a positive impact of OSCAR on senior drivers. There was a statistically significant improvement in mean scores for all questionnaires (IOK, COA and UCS) (p≤.001) and important effect sizes were observed (d>0.8). Conclusion(s): This study demonstrate that OSCAR can increase knowledge about safe driving and awareness of the limits of driving for seniors as well as enhance use of compensatory strategies. Given that the number of senior drivers is constantly increasing, such awareness interventions could play a major role for safety of public road users. Further research should assess the impact of OSCAR on persons whose deficits are due to pathological aging. Eye care professionals use diagnostic eye drops on a daily basis for their anesthetic, mydriatic and cycloplegic effects. Once opened, pharmaceutical companies recommend discarding ophthalmic drugs after 28 days. However, this recommendation applies to patients who self-administrate their prescribed eye drops in a home setting. The aim of this study was to evaluate the preservation period and the efficacy of ophthalmic preparations, such as Alcaine®, Mydriacyl®, Mydfrin® and Cyclogyl® in a clinical and controlled setting. Purpose: Eye care professionals use diagnostic eye drops on a daily basis for their anesthetic, mydriatic and cycloplegic effects. Once opened, pharmaceutical companies recommend discarding ophthalmic drugs after 28 days. However, this recommendation applies to patients who self-administrate their prescribed eye drops in a home setting. The aim of this study was to evaluate the preservation period and the efficacy of ophthalmic preparations, such as Alcaine®, Mydriacyl®, Mydfrin® and Cyclogyl® in a clinical and controlled setting. Methods: 38 primary eye care students were recruited to participate in the study. They used 25 bottles of each diagnostic drop at the “Clinique Universitaire de la Vision” for a 7-month period. An analysis of the bacterial contamination was repeated ten times using both an agar plate and a nutrient broth, at time 0, 2, 4, 6, 8 weeks and 3, 4, 5, 6, 7 months. The anesthetic (Alcaine®), mydriatic (Mydriacyl®, Mydfrin®) and cycloplegic (Cyclogyl®) effects were tested after seven months of use and compared to non-opened ophthalmic bottles. Results: During this period, 4971 drops of Alcaine®, 3219 drops of Mydriacyl® and Mydfrin® and 1896 drops of Cyclogyl® were administered to patients. Contact between bottles and biological tissues were reported 80 times for Alcaine®, 53 times for Mydriacyl®, 38 times for Mydfrin® and 52 times for Cyclogyl®. Following the 10 inoculation sessions on the agar medium at the predetermined times, no bacterial and fungus contamination was noted. No patient reported eye infections between two weeks following drop instillation. Moreover, there was no difference in the efficacy when compared with new drops. 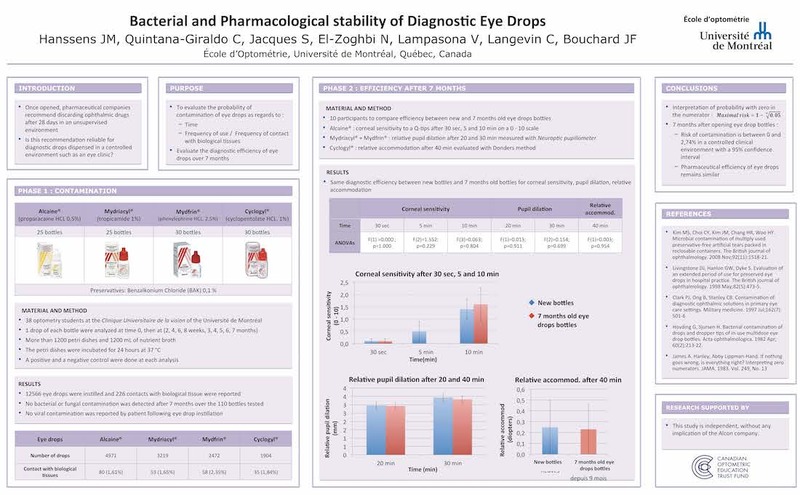 Conclusion(s): According to the results of the current study, diagnostic eye drops can be used with a low contamination risk beyond the recommendation date of 28 days up to 7 months, with the same efficacy, in a controlled clinical context. Jean-Marie Hanssens is an assistant professor at the Universite de Montreal. Its research activities are concentrated around ophthalmic optics and progressive lenses. In addition to his research activities, he held the position of clinic director and residency program director. Bibliometric analysis of optometry program productivity. Purpose: Bibliometric analysis of optometry program productivity. Methods: Web of Science (WoS) search for optomet* in the author address field of articles, 2000-16: data set of 13,177 articles. WoS analytics & citation counts used for analysis. Results: Years: 2000-01: 400 publications/year; 2016: >1200 articles. Organizations: 6000+; UC-Berkeley, 928; U Houston 839, U New S Wales/U Waterloo 777 each, U Melbourne 710. 500 programs produced ≥11 publications. Subjects: 7926 papers published in journals classed as vision; 1480 neurosciences, 670 optics. Countries: 3562 papers ≥1 U.S. author; Australia 1781, UK 1239, PRC 824, Canada 772. 17 countries produced a single paper. Journals: 1500+; Optom Vis Sci 12%, IOVS 10%, Ophthalmic Physiol Opt 5%. Authors: 30,000 individual authors. Most productive: Qu, Wenzhou, 166 papers; Atchison 140, Queensland U Technology; Willcox 135, U New S Wales; Lu 132, Wenzhou; Levi 124, UC-Berkeley. Group Authors: PEDIG, 23 papers, CLEK 19, CLEERE 17 & COMET 13. Funding Agencies: 6000+ funders; many papers credit multiple funders. NIH funded 2560, 19% papers; 68% specified NEI. Nat’l Natural Science Foundation, China, funded 269; Australian Research Council 162; Wellcome Trust 153; RPB 101. Journals: Optom Vis Sci led, 1523 articles; Adv Exp Med Biol was the highest non-vision journal, 22. Citations: The most cited paper (Qu et al., ACS Nano 2010) by authors in China, Korea & the U.S., has been cited 1800 times. The top-cited paper by an NEI-funded researcher, 389 citations, by D. Levi (Vis Research, 2008); most-cited paper in a vision journal by Beratty et al. (Surv Ophthalmol, 2000). 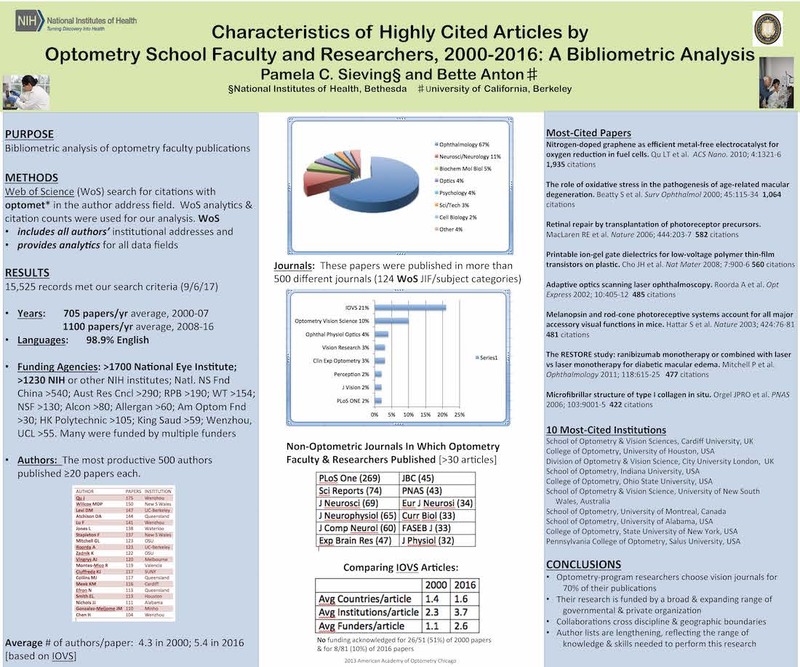 Conclusion(s): Publications by authors in optometry programs are not limited to clinical optometry, vision-related basic research, or vision journals. The research is supported by a broad range of funders, based in collaborations across disciplines & geographic boundaries, resulting in lengthy lists of authors, institutions & funding agencies. Pamela Sieving, MA, MS, AHIP, is a biomedical librarian with 30 years in vision librarianship (University of Michigan Department of Ophthalmology and Vision Science; NIH National Eye Institute). She is president of the Cogan Ophthalmic History Society. Bette Anton, MLS, is librarian emerita at the University of California, Berkeley’s Fong Optometry Library. Both work with the Association of Vision Science Librarians to make vision literature freely available, particularly in developing countries, believing this is a human right. Gyan “John” Prakash, PhD, is Associate Director for International Programs at the NEI, and faculty sponsor of the NIH Global Health Interest Group. Optical coherence tomography angiography (OCTA) is an emerging non-invasive imaging technology that allows in vivo visualization of the retinal and choroidal vasculatures, including the peripapillary capillary network. Over the past couple of years, the use of OCTA has provided insights into structural and functional vascular characteristics of various retinal and optic nerve disorders including ischemic optic neuropathies. Introduction: Optical coherence tomography angiography (OCTA) is an emerging non-invasive imaging technology that allows in vivo visualization of the retinal and choroidal vasculatures, including the peripapillary capillary network. Over the past couple of years, the use of OCTA has provided insights into structural and functional vascular characteristics of various retinal and optic nerve disorders including ischemic optic neuropathies. 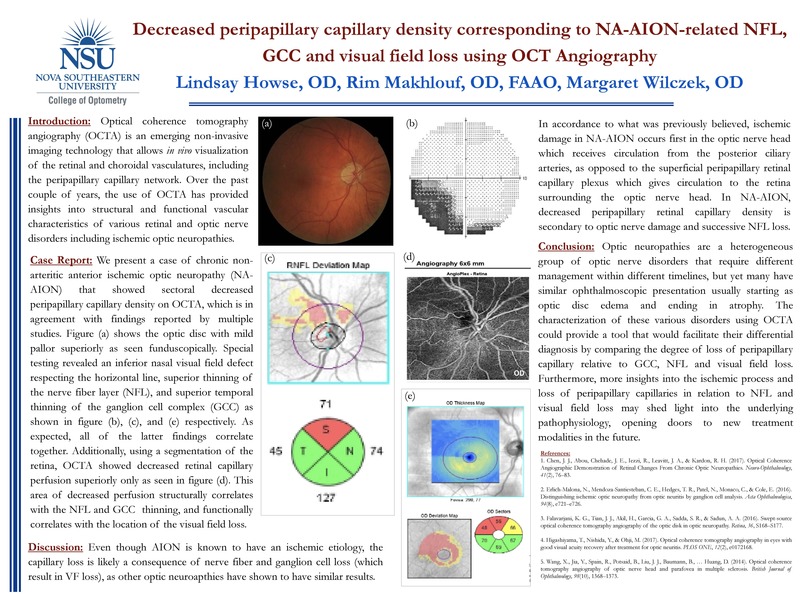 Case Report: We present a case of chronic non-arteritic anterior ischemic optic neuropathy (NA-AION) that showed sectoral decreased peripapillary capillary density on OCTA, which is in agreement with findings reported by multiple studies. The correlation of the OCTA with the nerve fiber layer (NFL), ganglion cell complex (GCC), and visual field loss will be discussed, as well as the significance of this correlation in terms of eliciting the underlying process. Discussion: Optic neuropathies are a heterogeneous group of optic nerve disorders that require different management within different timelines, but yet many have similar ophthalmoscopic presentation, usually as optic disc edema or atrophy. The characterization of these various disorders using OCTA could provide a tool that would facilitate their differential diagnosis, allowing for prompt and accurate management of the condition. Furthermore, more insights into the ischemic process and loss of peripapillary capillaries in relation to NFL and visual field loss may shed light into the underlying pathophysiology, opening doors to new treatment modalities in the future. Otitis media and mastoiditis are fairly common occurrences in the pediatric population and are among the most common reasons children will see ENT specialists. However, a rare but very possible complication can include sinus thrombosis, more specifically lateral sinus involvement. This can result in an increased intracranial pressure (ICP) thus result in bilateral optic nerve edema and/ or diplopia due to sixth nerve palsies. Introduction: Otitis media and mastoiditis are fairly common occurrences in the pediatric population and are among the most common reasons children will see ENT specialists. However, a rare but very possible complication can include sinus thrombosis, more specifically lateral sinus involvement. This can result in an increased intracranial pressure (ICP) thus result in bilateral optic nerve edema and/ or diplopia due to sixth nerve palsies. Case Report: A 5 year-old Caucasian female was referred to our clinic for diplopia following a 3 day hospital stay for treatment of dehydration, headache, vomiting, acute otitis media and mastoiditis. Best corrected visual acuities were 20/30 OD and 20/30- OS. Pupils were normal without APD but she was noted to have a mild left sixth nerve palsy. Anterior segment was within normal limits both eyes but the dilated examination revealed grade 3+ bilateral optic nerve edema. A CT scan had been performed when the patient was in the hospital so an MRI/MRA was ordered urgently for this patient which demonstrated a resolving left lateral sinus thrombosis with a suspected etiology of acute mastoiditis. She was re-admitted and treated with additional antibiotics and given anti-coagulant treatment until resolution of the thrombosis. 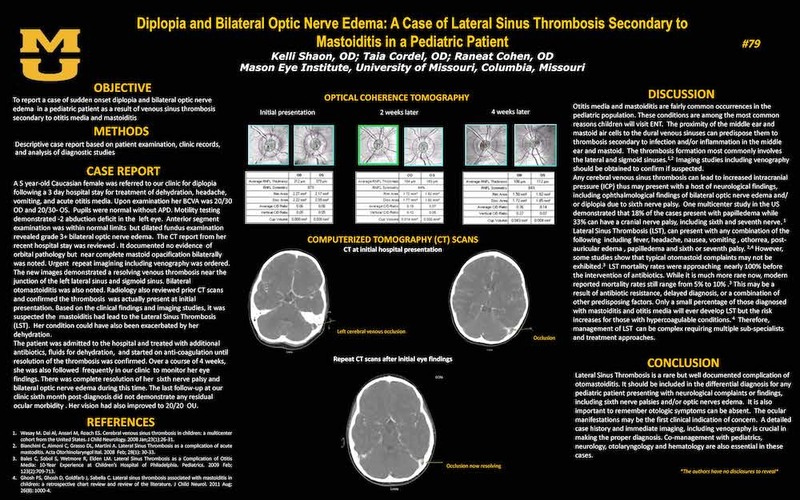 Discussion: Lateral Sinus Thrombosis (LST) while rare, can be a complication of mastoiditis. It had almost 100% mortality rate before the intervention of antibiotics at the beginning. Therefore if not diagnosed, the rate of mortality or morbidity is extremely high especially in the pediatric population. Ocular findings including optic disc edema and nerve palsies often occur with this condition. Conclusion(s): Ocular signs and symptoms may be the first findings in LST and therefore requires the pediatric eye care provider to be an essential part in making the diagnosis and assisting with proper management of these patients. Co-management with neurology, otolaryngology and hematology are often critical in these cases. A prospective, randomized, masked pilot study to compare the effectiveness of partial hyperopic correction with full hyperopic correction in reducing the magnitude of new onset esotropia in children. 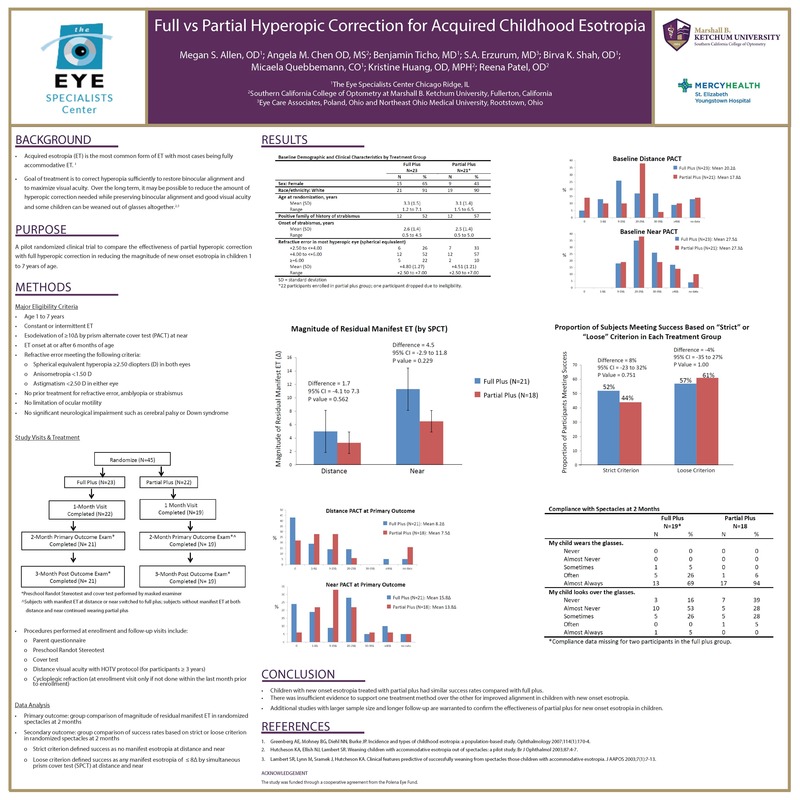 Purpose: A prospective, randomized, masked pilot study to compare the effectiveness of partial hyperopic correction with full hyperopic correction in reducing the magnitude of new onset esotropia in children. Methods: 45 children age 1-7 years with new onset esotropia of at least 10¿ at near and spherical equivalent hyperopia ≥ 2.5 diopters were randomly assigned to full plus correction or partial plus correction (1 diopter less than full plus). Primary outcome was a group comparison of success rates based on strict or monofixation criterion in randomized spectacles at 2 months. Strict criterion defined success as no manifest esotropia at distance and near while monofixation criterion defined success as any manifest esotropia of ≤ 8¿ measured at distance and near. Results: 39 participants (21 in full plus and 18 in partial plus) completed the primary outcome examination. Mean age (3.3 years in full plus and 3.1 years in partial plus) and mean refractive error in the most hyperopic eye (4.8D in full plus and 4.5D in partial plus) were not statistically different between the two groups. When strict criterion was used, the success rate was 52% (11 of 21)in the full plus group and 44% (8 of 18) in the partial plus group (p=0.751). When monofixation success criterion was used, success rate was 57% (12 of 21) in the full plus group and 61% (11 of 18) in the partial plus group (p=1.00). Conclusions: Children with new onset esotropia treated with partial plus had fairly similar success rates compared with full plus. Therefore, there was insufficient evidence to support one treatment method over the other for improved alignment in children with new onset esotropia. Additional studies with larger sample size and longer follow-up are warranted to confirm the effectiveness of partial plus for new onset esotropia in children. To investigate the practice patterns of current practitioners regarding water use and gas permeable (GP) contact lens care and perceptions of how water impacts infection risk. Purpose: To investigate the practice patterns of current practitioners regarding water use and gas permeable (GP) contact lens care and perceptions of how water impacts infection risk. Methods: A branched-logic electronic survey was administered to 1808 current members of the Cornea, Contact Lenses and Refractive Technologies section of the American Academy of Optometry. Statistical comparisons were calculated using Chi-Square analysis. Results: The survey was completed by 146 individuals (8%). Contact lenses were fit by 93% of the sample, and of those, 94% fit GPs. Rinsing GPs with tap water in office was reported by 57%, but only 35% report rinsing GPs in front of patients. Seventy-four percent of those surveyed educate patients to avoid rinsing GPs with tap water. The most common solution type for corneal lenses was a two-step system (39%) with peroxide being the most common for sclerals (52%). For storage cases, 50% recommend no water use when cleaning storage cases and 88% recommend a replacement schedule, with 82% of those listing 1-3 months as the optimal replacement interval. 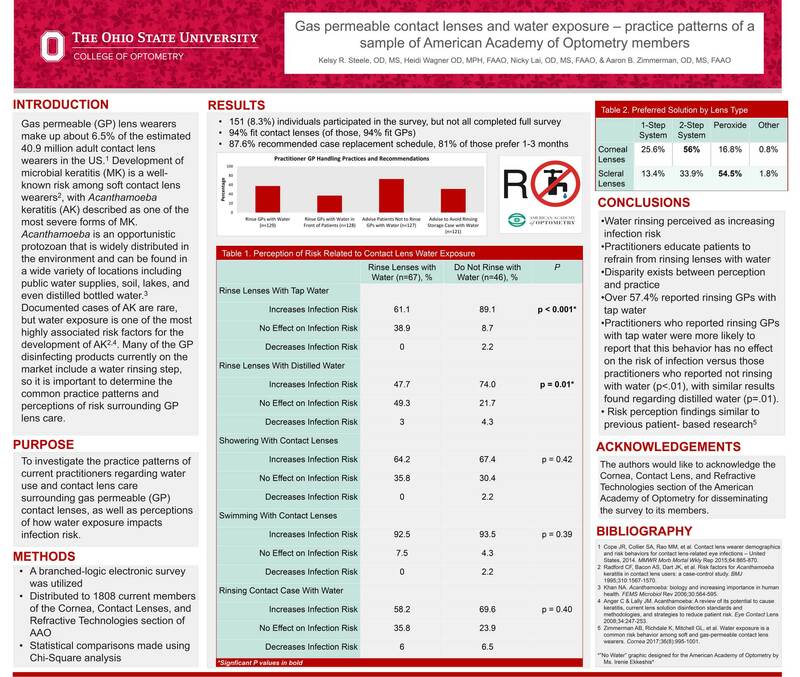 Practitioners who reported rinsing GPs with tap water (n=65) were more likely to report that this behavior has no effect on the risk of infection compared to those who reported not rinsing with water (n=45) (p < 0.001). There was a similar relationship regarding risk perception with distilled water (p=0.01). When asked about GP solution instructions, 75% reported that manufacturers should consider modifying the rinsing step instructions. Those who reported avoidance of GP tap water rinse were more likely to support modifications to product instructions (p < 0.001). Conclusion(s): Practitioners perceive that rinsing GPs with tap water increases the risk of infection and also report that they educate their patients to refrain from a tap water rinse. However, a disparity exists between risk perception and clinical practice, with over half of those surveyed rinsing GPs with tap water.